Kuih Semperit is Malaysia’s answer to the Scottish butter cookie: it became known as semperit because the Malay chef mispronounced ‘shortbread’. Others point to Indonesia as its origin. It is usually shaped into either the dahlia flower pattern or round biscuits with a ridged, serrated surface. 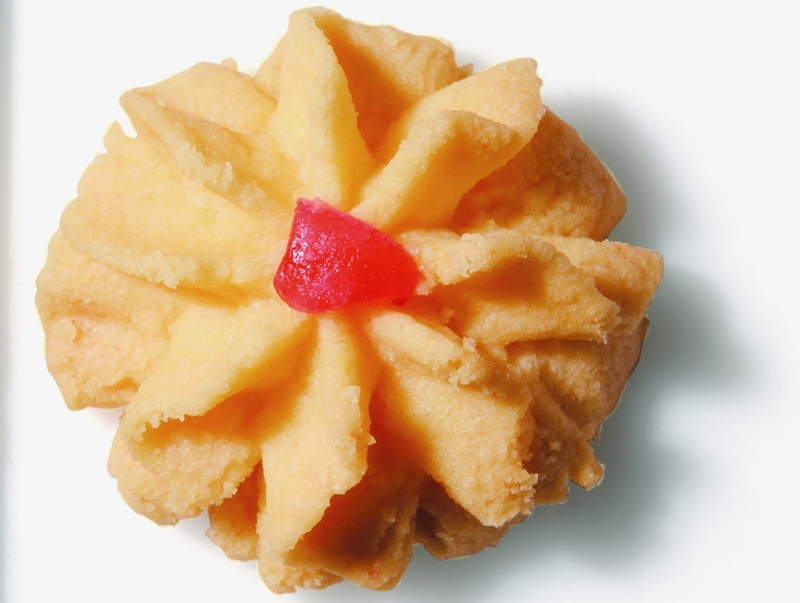 Other name for this biscuit: Biskut Bunga Dahlia. Using an electric mixer with a paddle, cream butter and caster sugar on medium speed until light and fluffy. Add egg yolk and vanilla essence. In a separate mixing bowl, combine flour and custard powder. Add about 3/4 of the flour mixture to the butter mixture to form a soft dough. Place a tiny piece of cherry in the centre of the flower and press down lightly. Continue until all dough is used up. Add butter if dough becomes dry and will not extrude properly. Bake in preheated oven at 180°C for about 20 minutes or until lightly browned.